Serving Frederick County since 1989! Our office delivers clean homes and peace of mind for Adamstown, Braddock Heights, Brunswick, Buckeystown, Burkittsville, Cascade, Emmitsburg, Frederick, Ijamsville, Jefferson, Keymar, Knoxville, Ladiesburg, LIbertytown, Middletown, Monrovia, Mt. Airy, Myersville, New Market, New Windsor, Point of Rocks, Rocky Ridge, Sabillasville, Smithburg, Sykesville, Thurmont, Tuscarora, Union Bridge, Walkersville, Woodbine, and Woodsboro. We proved we’re the best house cleaning company in the area by earning Maid Brigade’s Franchisee of the Year Award in 1995 and 2015, and we know we’re still the best because homeowners turn to us again and again. • Reliable cleaning is the only kind of cleaning we do. Our professional maids ring your doorbell on your scheduled day of service. We treat reliability as job #1. We have scheduled your cleaning and you have prepared for us, so we will be there for you. • Trust is the foundation of professional home cleaning. We screen each and every employee that cleans for us. We do a background check on everyone that works for us. All of our team members are comprehensively insured and bonded for your peace of mind. • Details matter. We train every new employee on our Maid Brigade system to ensure a thorough and complete cleaning.We love to do in-home estimates so we can find what you like, or dislike, in particular.And, our household cleaning pros don’t take half-measures when it comes to household cleaning. We have a 45-point inspection that each Team Supervisor completes to ensure a job well done. We are the only local service that is Green Clean Certified®. Our teams only use products without harsh and damaging chemicals found in traditional solutions. Our solutions are independently certified by Green Seal. You can feel safe that toxins are not used in your home.We also use fresh and clean microfiber and a backpack, HEPA filtered vacuum, in every home we clean.All this to make your home healthier and cleaner. Our personnel are Maid Brigade employees; we do not subcontract our services. Our teams clean the same houses unless one is out sick or on vacation. We do not switch our teams around all the time. All of your cleaning instructions and comments are computerized. Our phones are always staffed during business hours to ensure that you can speak to us if you have any questions or concerns. *Email after hours for your convenience. 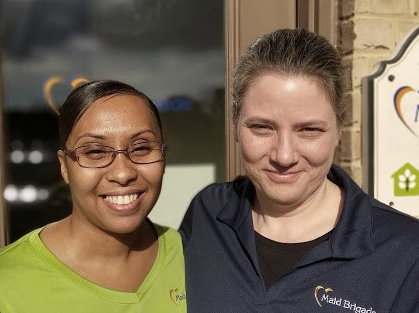 Our office staff includes Lashae and Rachel (shown below) with a satellite office including Mercy and Logan. Any of us can help when you contact us or call! Next steps: For a price quote range, you can fill in some quick info on our Get an Estimate page. If you have more questions, would like more information, or would like to schedule your free In-Home Estimate, please fill out the Contact Us information or call us at the office, 301-698-9204. Thank you for your interest in Maid Brigade. We hope you become one of our long-term happy Maid Brigade customers!